Spring is coming! It's time to plan your landscape! Have you recently bought a new house? Or is this the year you've resolved to finally do something about your home's drab outdoor style? The decision to design and install landscaping with a professional flair is a major rite of passage. It means investing in your living space and showing off your personal style to the world. Here are 7 essential landscaping tips to get you started. Begin with an accurate rendering of the dimensions and shape of your lot, based on information from your home's builder or your local government archives. Where is your house placed on this lot? Which directions does it face? What are the outstanding characteristics of your lot -- for example, slope, views, strong winds? How's your soil? A soil analysis will help you choose plantings suitable for your micro-conditions. Investigate any regional requirements or limitations such as zoning laws and lawn watering restrictions. Brainstorming time. Think about who will use your outdoor space and for what purpose(s). How will you improve the property's function and its value to you? Decide how to work with what you have been given. Will you keep the natural landscape as is or make some amendments? For example, you may be charmed by the natural shadiness of a garden corner, especially if you live in a warm climate. However, if your whole garden is dim, you might want to cut back some of the growth to let the sun shine in. How much care are you prepared to lavish on your landscaping in terms of time, labor, and financial expense? The amount and level of difficulty of maintenance should be realistic and readily achievable, not just for you as a gardening fan, but also for possible future owners or caretakers. 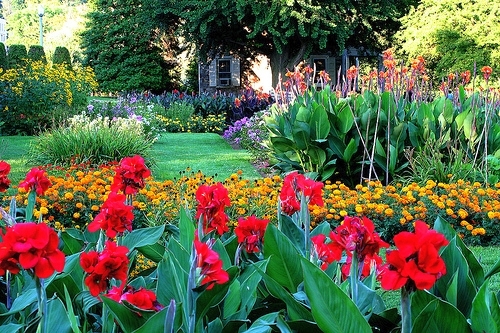 This will guide you in choosing the right plants and garden layout. Make sure that all areas of the property are accessible to any equipment necessary for their maintenance. Today's garden must be green in more than just color. Consider water-sparing, sustainable landscape design such as xeriscaping. This might be a good time to set up a greywater system for environmentally friendly watering. Incorporate the idea of soil conservation as well. Design and install your landscape installation not only to prevent soil loss through runoff, but also to actively safeguard and nourish the earth through measures like composting and the avoidance of toxic pesticides. Build increased accessibility and safety into your landscape design. Carefully placed walkways and attractive exterior lighting systems will welcome exploration of your garden and increase visitors' enjoyment, while they minimize tripping (and liability) hazards. Take into account other outdoor safety issues, such as pest control, fencing, fire prevention, and home security, at the same time. Several design principles combine to create a beautiful landscape. Garden elements should harmonize in both style and proportion with each other, with the era and design of your home, and with the character of the neighborhood as a whole. The overall landscape should be simple yet varied, not cookie-cutter symmetrical but harmonious. And it should include plenty of the colors, shapes, and scents which please you most. One of the most essential landscaping tips is to value individual taste ... your own and your family members'. Sometimes you might choose to incorporate a feature -- perhaps a planting or a bench -- into your landscape that theoretically won't work. It may be way out of proportion or totally dissimilar to the landscape style as a whole. However, according to the Japanese concept of wabi sabi, this quirkily personal touch could be just what's needed to make your landscape complete.